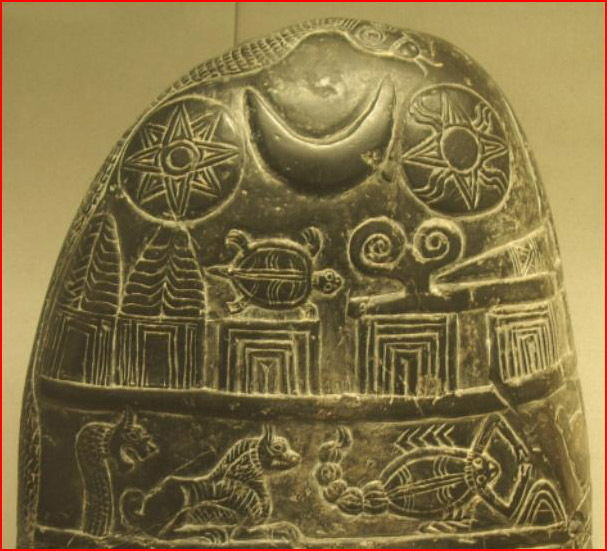 The photo above is a stone kudurru from about 1125-1100 BC. This stone records a gift of land made by Eanna-shum-iddina, governor of the Sea-Land in southern Babylonia. The boundaries of the land are carefully defined, and the names of the men responsible for the survey are included. The text ends with a series of curses on anyone questioning the gift or damaging the stone. The symbols above the writing represent gods. The Venus star is the symbol in the left-top corner. British Museum, London [30-5-2004]. Similar symbols for Venus are found in divergent cultures around the world. Prehistoric legends about Venus are uniformly absurd. (See The Many Faces of Venus by Ev Cochrane.) Sumerian hymns called Venus the "queen of heaven," who was "as bright as the sun," who would "flash like lightning," and who issued a "deafening command." Siberian legends call Venus "the daughter of the Devil" who brings disaster and has a tail. She was a "flower star" to both the Maya and Chinese, and the Inca described her as the "originator of the flowers." Both Aztecs and Maya called Venus a "smoking star", as did certain tribes in Siberia, Polynesia, and Africa. We dismiss the absurdities of each of these legends with a casuistic reflex born of modern knowledge and the presumption of its universality. So to be made aware of the uniformity of the absurdities among cultures on opposite sides of the Earth at every point comes as a shock. 1) All the legends are variants of one story based on common experience of a global and objective event. 2) All the legends are variants derived from one storyteller in one primordial culture and spread to all other cultures. 3) All the legends are variants of one storytelling faculty rooted in a mythmaking ganglion of nerves somewhere in the human nervous system, active at the dawn of history but quiescent ever since. The one story explanation is the simplest. Its only obstacle is that Venus "brighter than the sun" "with a tail" or "smoking" contradicts modern astronomy¹s assumption of an uneventful solar system whose planets have rolled around their present orbits for billions of years. The witness of our ancestors, although presented in the imagery of myths, seems quite serious, in fact, terrified, that the modern assumption is dead wrong.